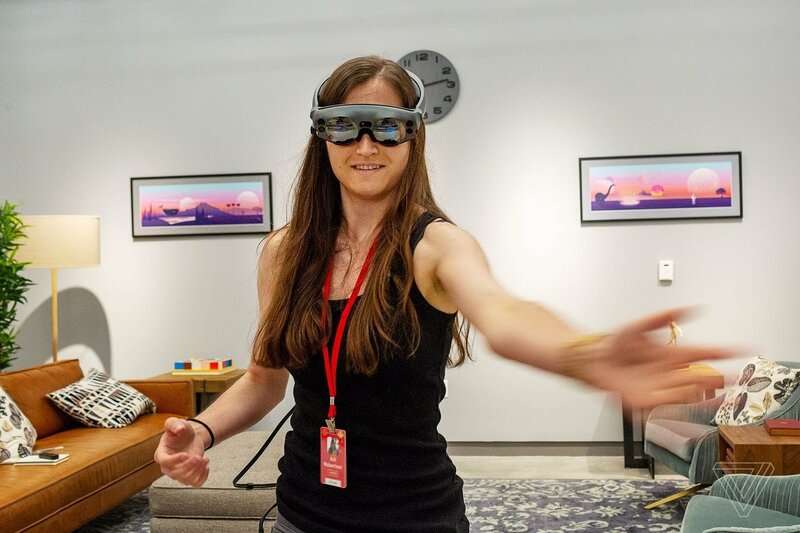 Magic Leap calls itself a “spatial computing” company, but it produces what most people call augmented or mixed reality experiences: hologram-like objects projected into three-dimensional space. Modern smartphones offer a primitive version of mixed reality, and headsets like Microsoft HoloLens offer a more advanced version for industrial and professional use. CEO Rony Abovitz claimed that Magic Leap’s hardware will “transcend what can be contained in a physical product.” He announced the company with a 2012 TedX talk in which he donned a full space suit and spoke for 30 seconds. Today, he won’t even confirm it was him in the suit. 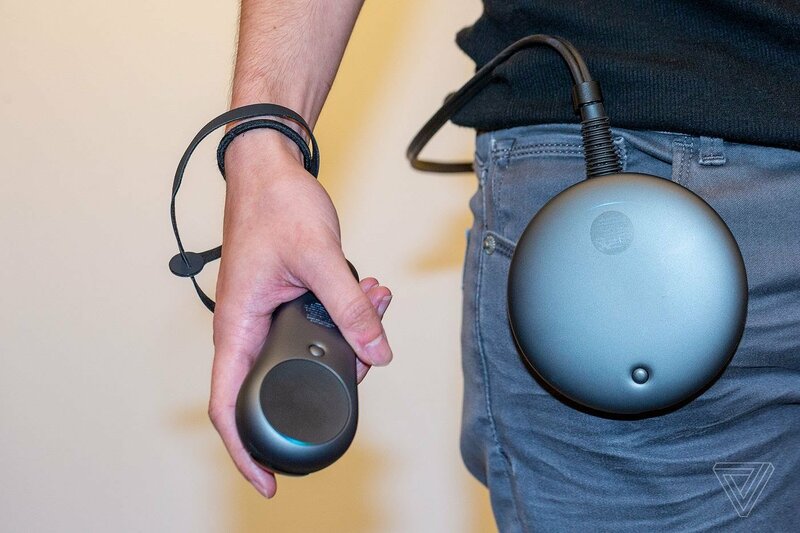 The Magic Leap One is a three-piece system that includes a headset called Lightwear, a small wearable computer called the Lightpack, and a handheld controller. Like every mixed reality company, Magic Leap eventually wants to make a normal-looking pair of glasses that can be worn everywhere. For now, the headset is only guaranteed to work indoors, and it includes Bluetooth and Wi-Fi antennas, but no mobile data options. AT&T has already committed to selling a future version with wireless data plans, though, and Abovitz says you can use the current version “at your own risk” outside. Still, Magic Leap is one of the best (if not the best) pieces of mixed reality hardware on the market today. But after all of Magic Leap’s descriptions of its unique hyper-advanced light field technology, it didn’t feel categorically different from something like HoloLens — which was released two years ago, and has a second generation on the horizon. I’m not convinced Magic Leap’s photonics chip is practically that different from other mixed reality waveguides, or that Magic Leap is doing something other companies couldn’t replicate. But instead of showcasing the strength of its possibilities, my Magic Leap One app demos kept highlighting the weaknesses of its technology. I could imagine replacing my television with a virtual screen, but not one that clips in half when I’m not staring straight at it. I kept forgetting where I’d placed small virtual objects in a room. Full-room experiences, like the beautiful underwater seascape of Tonandi, always felt clearly artificial. The issue wasn’t just technical limits, it was apps that didn’t seem designed to work well within those limits. So unless Magic Leap is deliberately holding any big projects for a consumer release, I’m not sure what its internal studios and partners have been doing with several years and virtually unlimited funding, and why it wouldn’t showcase more of their work during the Magic Leap One’s big debut. With nearly every big tech company making a play for mixed reality, it’s an area ready for disruption. Early adopters are ready for a big step forward, but at over $2.2k, it’s not clear that Magic Leap One will really meet that need for everyone. With the failure of Google Glass, what will it take for a mixed reality hardware to be widely adopted? Batten down the hatches, because “immersive storytelling” has hit your television screen like a tornado. This week, The Weather Channel debuted a “mixed reality” broadcast, covering a theoretical tornado, using the additional layer of reality to show what can happen during one, in order to offer tips on how to react if you find yourself in the middle of one. While it would certainly be more magical if the mixed reality effects were happening in your actual living room, it’s indicative of the changing face of video, including TV. As technology is allowing for it, the way we experience video content is poised to transform, adding a new layer to things we’ve never seen before. Indeed, Weather Channel alone claims it will “use this method in 80% of all its programs by 2020”. …you could interact with pretty much anything your mind can dream up. Disney Research developed a somewhat lo-fi solution for mixed reality that requires no special glasses or singularity type of stuff. Its “Magic Bench” allows people to interact with things that aren’t there, watching the action in 3rd person view, on a screen broadcasting them. It even provides haptic feedback to make it feel like the imaginary character or object truly is on the bench with you. 1) It’s a great example of technology enabling a physical experience without getting in the way. Historically, augmented/mixed reality required some type of personal technology like glasses/headset, or a phone. This requires nothing from the user but their presence. 2) It shows how Disney is using technology to create experiences that extend its “magical” brand into the digital age. I came across the short film Strange Beasts this week, which in a way slightly lighter than Black Mirror explores the peculiar realities of a mixed reality world. The full 5 minutes are well worth watching, it’s a quick story, but the pertinent parts are probably the first minute, and from about 2:40-4 minutes, when it implies its central philosophical question. I thought this would make for a good discussion.